Friday evening brought a welcome BBQ to ease us into the weekend. 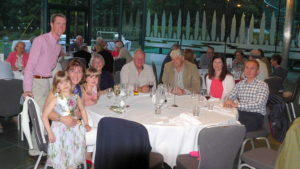 In a beautiful setting overlooking the lake, we dined on freshly grilled delights on an outside buffet at the comfort of our own tables hosted by Master, Senior Warden, Junior Warden Elect and Immediate Past Master. In the true ‘include’ theme of the weekend, the children present thoroughly enjoyed the BBQ and went off to explore the climbing frames while the adults sat back and enjoyed the atmosphere. As the cool of the evening settled in and the wine flowed, those present mingled and enjoyed both catching up with acquaintances and making new friends. A few wondered if they had partaken a little too much at this early stage as we saw what we like to think was a fairy over the lake (though don’t tell the Master it could well have been a drone with sparklers attached). Either way, a very agreeable start to what was to be a fun filled and very ‘inclusive’ weekend. 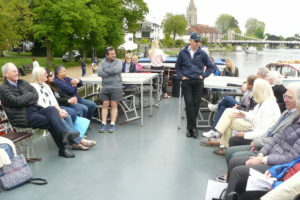 Our river cruisers enjoyed an afternoon of beautiful sunshine (to begin with), many having a glass of bubbles in hand. Properties spotted on the river side with closely manicured lawns, were slightly beyond our pocket. However, the wildlife was fascinating, wild fowl and ‘weeny’ goslings in abundance. The Master kindly arranged a generous finger buffet, much enjoyed in the afternoon sun. Smooth passage upriver with a short delay at only one of the three locks transited ensured there was time to moor up and take a trip ashore to explore a little of Henley’s delights. Shortly after a leaving the Henley Regatta course in our wake on the return leg, the weather changed affording the opportunity to go below, hoover up a little more of the buffet and ‘circulate’. The afternoon ended very satisfactorily, albeit under an umbrella. 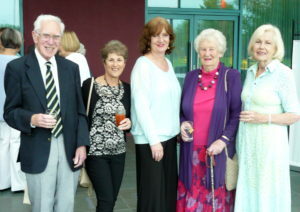 The informal barbecue supper provided on Friday 11th May was followed on Saturday 12th by a more formal dinner. This was held in the Glaze Conservatory restaurant of the Crowne Plaza Hotel at Marlow. Guests were seated at four circular tables each presided over by a senior Member of the Company, namely, the Master, Senior Warden, Junior Warden and Junior Warden Elect. The three-course dinner included two well-chosen fish courses, followed by a tasty sweet course. Conversation at the tables was lively; at your correspondent’s table it ranged from Obstetrics to Inheritance Tax! The Senior Warden, Shravan Joshi, made a presentation of a thank you gift to the Master of a pair of earrings. In her response the Master expressed her particular pleasure, on behalf of the Company, at the presence at the dinner of Mrs, Doreen McGechan, the widow of Mr. George McGechan who was Master of the Company in 1989/90. 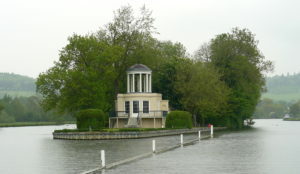 Mrs. McGechan is a resident of Marlow. Towards the end of the meal, Roger Cloke, Membership Assistant, delivered a stirring call to all Members of the Company to do their utmost to recruit new members to the Company by means of approaches to colleagues, friends and acquaintances within the energy industries, customers, and, even, competitors. The Sunday morning saw us all convene, with excellent direction from Peter on various street corners, at Bekonscot Model Village & Railway which first opened in 1929 and is still going strong! The beautiful vintage railway carriage was a clue of delights to follow as we stepped into a miniature world… Armed with quiz sheets cunningly devised by our Master and pens at the ready, we all enjoyed a good peek into the miniature world that held many links to our Livery Companies! With so many details and Liveries to find, Mercers, Grocers, Shipwrights, Carmen and Apothecaries to name but a few, the detail was so fascinating that we could have stayed all day and still seen parts we hadn’t noticed before. The children thoroughly enjoyed seeing all the village and town scenes, from window cleaners falling off ladders to a thatched cottage on fire. It was not all drama with a beautiful circus, airfield of gliders, a cathedral mid Christening (although one bell ringer had not let go of the rope) and even a game of Rugby for Chloe to enjoy! There was also a light railway which some adventurous Fuellers went on for a ride, with the children of course! A thoroughly fun time was had by us all, thank you Master. The Master: Congratulations to Andrew & Ingrid Strawson and John Sharp who won the Quiz! 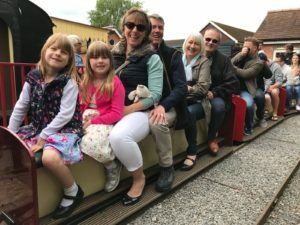 As the Bekonscot Village adventure for kids (both big & small ) drew to its conclusion, an advance party – led by the Senior Warden – set off to find our venue for Sunday lunch, The Crown in Penn. With a journey of less than 3 miles, it says much for the independent mindedness of Fuellers that five vehicles managed to find four different routes and arrived from all directions. Having re-assembled in the car park, the vagaries of UK licensing laws meant that our landlord was unable to admit the advance party straightaway – leaving this small group of Fuellers waiting on the pub doorstep anxiously clock watching. A new experience for some, a regular occurrence for others! As noon, and our main party, arrived all entered this delightful country pub for more drinks, conversation and good fellowship. 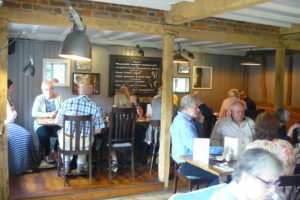 In fact the numbers and noise generated by this happy band of Fuellers meant that our landlord and his team were in need of assistance to ensure the correct lunch arrived with the correct Fueller. Once again our Master swung into action and was soon conducting the delivery of a variety of excellent roasts with the verve and deftness of a wannabe Henry Wood at the Last Night of the Proms. And then, after an equally delicious selection of desserts (which required your correspondent to redefine the meaning of the word diet), another excellent Master’s Weekend drew to a close – with all parties expressing their thanks and appreciation to both the Master & her Consort for the arrangements and their company over the three days. 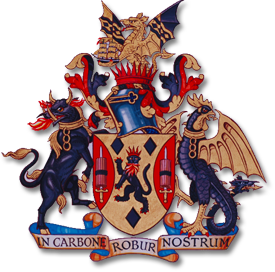 Many thanks to Liveryman David Rose for his photographic services throughout the weekend, and to JWE Carrie Marsh, CA Alan Dowdell, HCA John Sharp and Freeman Bert Marsh for their contributions to this report.